General Star Trek starship thread. Discussion in 'Trek Tech' started by Charles Markov, Oct 23, 2018. Then again, if a single planet can be lost to threat forces, why not many? A random force of nature demolishing a single planet might cease to be a concern eventually: the Feds can already divert asteroids and the like. A military attack capable of defeating one capital planet will be capable of defeating another, though... And if the idea is to deplete the forces of the attacker through defense, so that capitals 3 and 4 will survive after 1 and 2 are lost in valiant battles, why not concentrate the defenses so that even the first attack will fail? Because it’s a lot easier to lose a single planet to threat forces than it is to lose many? Because one secret nova bomb could end a war before a war is ever declared? If your entire 150 memberworld Federation, with thousands of colonized planets, can be taken out because you put all your eggs on Earth (because, hey, kids, we’re the tops!) then you deserve annihilation, and, let’s be real, Star Trek is a stupid show. Hell, that’s the point behind the decentralized nature of the internet, among others. The point of the internet and modern redundant design / systems is so that there is no 1 point of failure. You're literally arguing put all our major government aparatus / facilities in one Planet/City/Area. One of the reasons modern Internet / technology is as strong as it is, it's because of decentralization, redundancy, and endless backups. That's why a smart StarFleet is Half Exploration Arm, Half Military and with plans for all sort of contingencies. Plus Surprise attacks are what's going to get you if you aren't ready. That's why you need to secure your Planetary borders from invasion and protect it from attack within by having proper monitoring of what's going on. Any thing that is of value is properly guarded, secured, put behind lock & key along with posting security guards, cameras, sensors, and having fortifications. The UFP has been in too lax of a state for too long! That's why when Q was kind enough to give Picard a early encounter with the Borg so the Federation can be ready for them, what happens? Wolf 359 where the rest of the Federation local fleet got their arse handed to them and it was up to Riker getting lucky to save all of Earth. In the Dominion War, Earth was attacked because there wasn't proper Orbital defenses ready along with a planetary defense force ready. If it wasn't for Picard during the Battle near Sector 001 in First Contact, Earth would've been screwed. Being prepared means ALOT, it can prevent some of the worst things from occuring. On a tangent, I thought it would be interesting to look at some of the station designs. 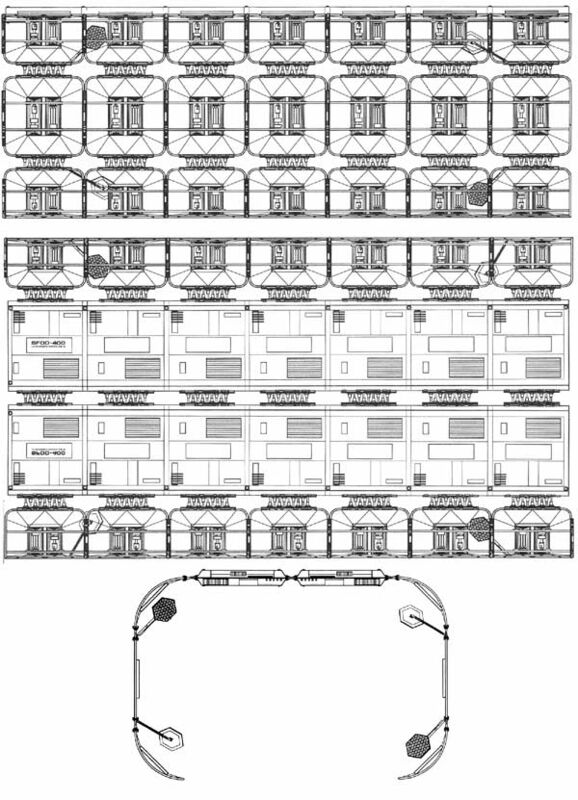 Jackill's has a nice description for the four drydock variants, and FASA suggested that the Regular design was simply one variant in a series of modular stations. Mk I Roman class drydock. 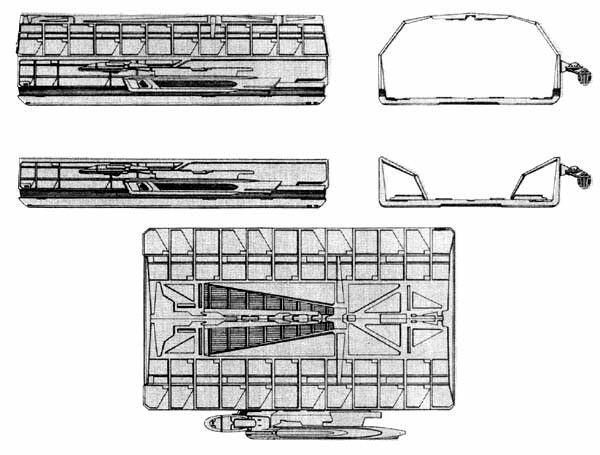 An older "basic" model used for civilian ships as well as Starfleet and military vessels. Mk II Pharaoh class drydock. A more flexible and improved version of the Roman, with the dock often "wrapping" around the specific hull design to allow for better work. Mk III Aztec class mobile drydock. This variant sports a warp nacelle and impulse drive along with a modified basic bridge and hangar module for support craft, with a maximum safe speed of warp 5 (it can achieve warp 6 and even 7 as emergency speeds, though the latter is likely to be destructive). It can be deployed as needed to support other shipyards or assist vessels who need emergency repairs and can't operate on their own power. It carries no defensive weaponry, but does have basic shields. Mk IV Maya class drydock. 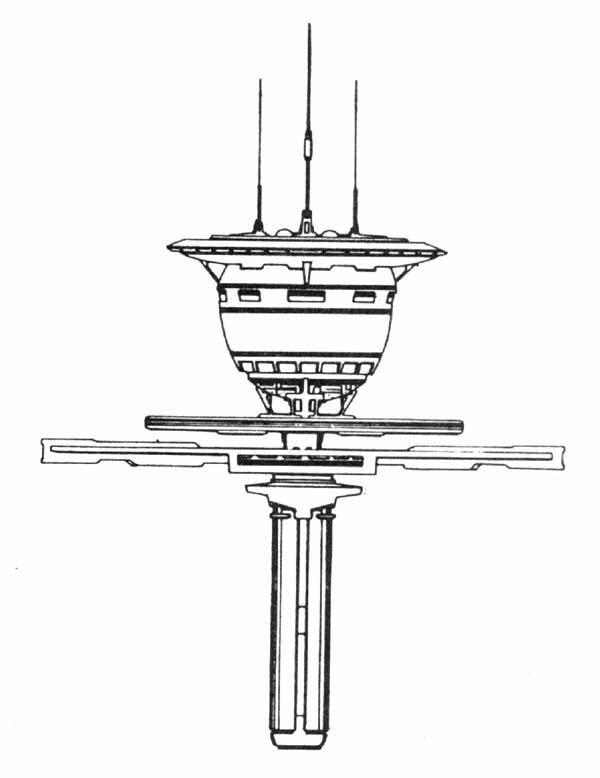 The most advanced model at this time, with the intent to eventually replace all of the older Romans in service. It has increased support elements. 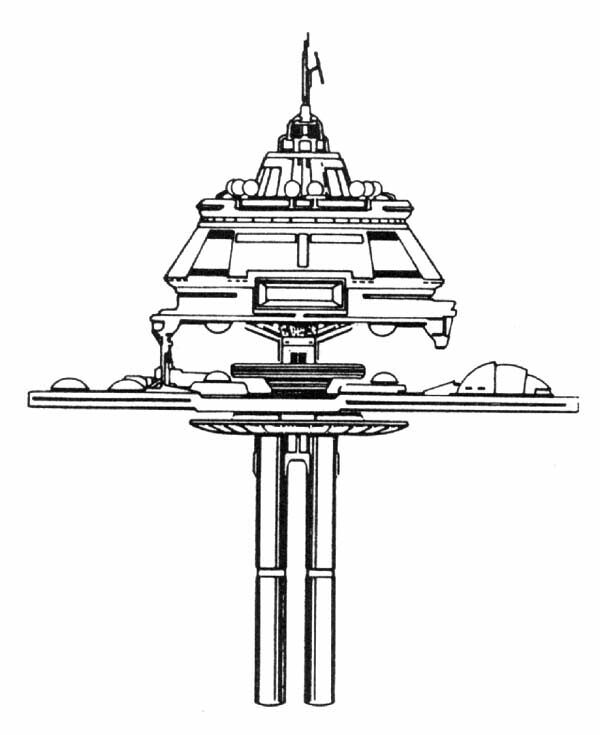 FASA had a mobile drydock, the Pearl, which is sort of a more military cousin of the Aztec model if the description is to be believed. It is mentioned as having seen service in the Four Years War, replacing the older and non-mobile Newport News class drydock (which had to be towed) and giving Starfleet a decisive advantage in ship repair. The Klingons didn't deploy such a unit until after the war. 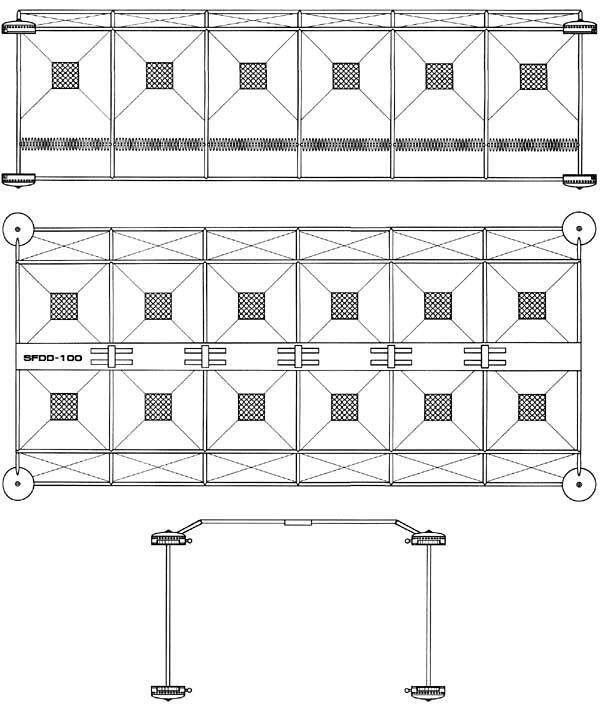 The Pearl is also said to be large enough to house two heavy cruisers simultaneously. Despite its military description, it only has shields and no defensive weaponry like the Aztec. 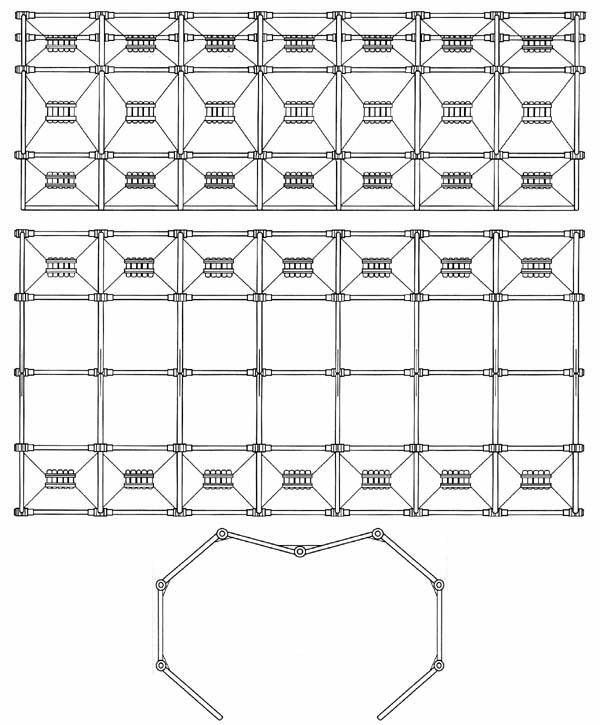 For the R-1 series based on the Regula blueprints, there was a range of different modules available. FASA also suggested, rather amusingly, that the highly specialized Samson tugs could be used to move the outposts if needed. Since such a project requires a huge power output, the Samson has only basic defensive shields and no weaponry since it can't spare the energy. The Invictus serves in the defense role, mounting 9 phaser banks and 6 torpedo tubes with some units being augmented by a squadron of Scorpio class corvettes. Primarily used to protect various borders, including the Klingon and Romulan neutral zones. It's tempting to think several of these might have been the outposts destroyed by the Borg in "The Neutral Zone." 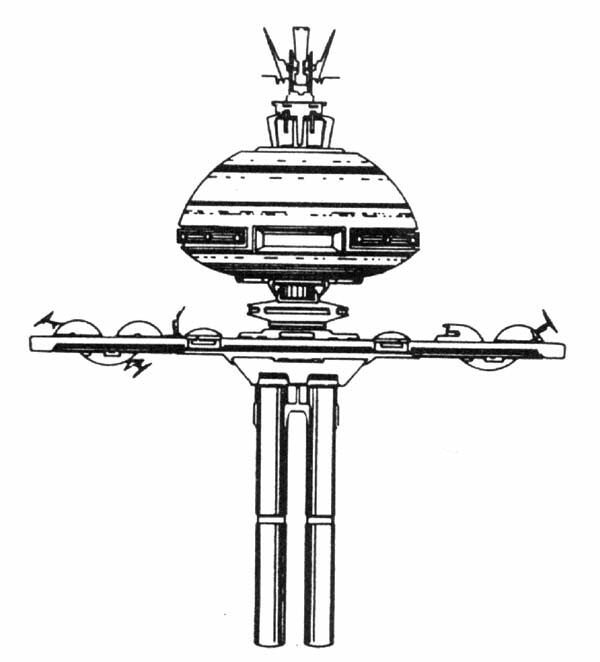 The Informant model was built to supplement the Invictus outposts by providing advanced sensors and computer analysis facilities. This station often monitors local ship movements and phenomena, and carries 6 phasers and 3 torpedo tubes for defense. The Investigator model is used to support scientific research in various sectors. This version has extensive labs and sensor equipment. The Artisan stations are manufacturing centers, designed to export a variety of goods that might need alternate gravities and other special environments. They sometimes act as trade hubs also. 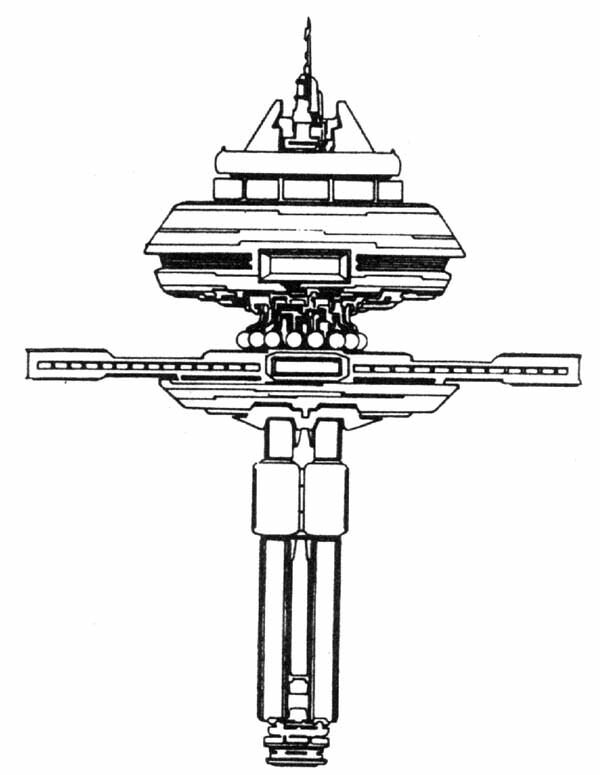 The Administrator variant is likely based on the office complex designed for TMP, although the illustration keeps the orientation consistent with the other R-1 models. Perhaps FASA intended it to be a separate unit, but it's not entirely clear. The Mercy configuration is a dedicated medical facility, combining both treatment wards and research for fields like xenobiology. The Harmony station is for recreation and cultural exchange. FASA even includes a casino module for economic studies. Right next to the wine cellar. Lastly, the Terminus version is a specialized prison station, used to house captured enemy agents and dangerous criminals. It is patrolled by corvettes and other local support craft and is armed with 3 phasers and 3 torpedo banks. DEWLine and Arpy like this. But that isn't necessarily true. After all, if one planet can be lost, it follows that whatever lost that one can lose another as well. And spatial distribution guarantees nothing. Planets rest in space, after all: the enemy has already traveled to a location to wreak the havoc, and is capable of doing that again. If one is to defend against traveling, one might just as well concentrate on defending a single point, which is the more efficient way. Distributing one's defenses merely weakens them, when the enemy can always concentrate his offense. As for how Earth is defended, the answer seems to be "just fine". The Breen attack utterly failed: three pillars of smoke rise from San Francisco, even though Star Trek weapons are capable of terminating civilizations and glassing continents in no time flat (see "The Die is Cast" for an example). It's just that assorted supervillains "shut down planetary defenses", so we don't see them in action all that often. But distributing those defenses would be madness. ^ I like the Aztec drydock especially, Unicron. Everything “rests in space.” Everything is both attackable and conquerable. Including the one spot in half the galaxy you’ve now made the irresistible target. The point is, do you make it a challenge to ingenuity to find one way to slip a suitcase nova bomb past security, or do you make it nearly impossible to decapitate/plunder an entire civilization? Under the ‘all the eggs in one basket’ setup you’re arguing for, one imagines the only reason Earth hasn’t been obliterated yet is because it’s a TV show. The Klingons nearly destroyed it on DSC if not for the mutually assured destruction on Qo’noS, not anything to do with Earth’s defenses. The Borg nearly assimilated it of not for the lucky break of having a man on the inside in Picard and an artificial life-form who could hack them in Data, again nothing to do with Earth’s defenses. Both V’ger and the Whale Probe nearly destroyed it if not for the whims of V’ger and the Whale Probe, nothing to do with Earth’s planetary defenses. And if the Breen could fire even a single shot to reach the surface, let alone a bunch, why not make it even a 20th century nuke — oh, right, it’s a TV show. I always figure that the Federation is the most advanced technical power in the quadrant. It ships are generaly faster, better armed, longer ranged, with better sensors and crew amenities. Klingons, Romulans, Gorn and others generally copy federation tech a few years after it is first developed. Everything is both attackable and conquerable. Including the one spot in half the galaxy you’ve now made the irresistible target. It wouldn't help at all to make fifty irresistible targets, though - because the enemy can always send its entire fleet against every single one of those fifty, one at a time. What good would it do to your star empire that the total annihilation of its sum total of capitals takes fifty days instead of one? Distributed isn't any more survivable than concentrated, not unless you distribute inside a defensive perimeter. And the UFP has none. Only the planets are inviolable as a rule. The point is, do you make it a challenge to ingenuity to find one way to slip a suitcase nova bomb past security, or do you make it nearly impossible to decapitate/plunder an entire civilization? We can already statistically rule out the "slipping a single-shot-to-success weapon past the defenders" model, because homeworlds as a rule don't blow up. They get attacked often enough, but the attacks basically always fail. OTOH, whenever these silver-bullet WMDs do work, such as in the 2009 movie, we don't see "ingenuity" as a requirement. It's just brute force so that nobody guns down the guy with the suspicious suitcase because everybody was gunned down in advance. And brute force is defended against with brute force, with the defender who divides and disperses his forces the one more likely to fail. Under the ‘all the eggs in one basket’ setup you’re arguing for, one imagines the only reason Earth hasn’t been obliterated yet is because it’s a TV show. We must take a step beyond that in any case. Trek has cloaks. Why don't cloaked ships kill planets, when it's established that single unopposed ships can do planeticide? We haven't been told, but nothing stops us from speculating, and we are obligated to accept that there is a reason. Homeworlds not getting blown up every Tuesday is a Trek feature. There is an explanation as to how this can be, just as there's an explanation for why Earth wasn't annexed to a star empire before we invented rocketry or watercolors or the needle. But the explanation isn't "distributing one's eggs" because this is not a Trek feature. The Klingons nearly destroyed it on DSC if not for the mutually assured destruction on Qo’noS, not anything to do with Earth’s defenses. To the contrary, the ability of the Klingons to ignore defenses was an all-new feature of the Trek game there, the cloak changing the rules. Until then, and after that time, Starfleet apparently solidly believed in its ability to keep invaders or suicide bombers at an arm's length. That's the key point, after the Dominion War and numerous losses, I'm pretty sure the planetary inhabitants are fed up with StarFleet not being strong enough and local Planetary / Solar Systems not having actual Defense Perimeters. It's not like they can't establish one, and a properly sized numerous species Union like the UFP should have ALOT of people wanting to join up with StarFleet and be part of the defense forces in general given the losses across all the various UFP holdings during the Dominion War. Look at the Final Battle around Cardassia, with the industrial might of the UFP, we can do that level of defensive measure for every significant planet (I define significant as any planet / colony with 1,000,000+ UFP citizenry living there permanently) within the member world of the UFP where it would take a even larger assault force then the allied UFP / Klingon / Romulan force just to conquer one planet. It's a matter of political will / investment into security. But after the numerous losses across many member species in the UFP, I'm sure they will be clamoring to build in redundancy / strength / defensive measures to protect their home planets / Planetary Systems. We're just gonna have to agree to disagree here on the Distributed vs Concentrated. I believe in a very distribute redundant nature of doing things. Look at the internet, it's designed around countless redundancies. Knocking down 1 or 2 servers shouldn't really affect it. We need a UFP that is SUPER resilient & redundant. Picked up the second Shipyards volume yesterday, which covers the modern era (with a few exceptions, like the Constellation class represented by the Stargazer). I like that it covers a wide variety of ships and includes all of the W359 vessels, along with some other ships that were only scratch built for a brief scene like the ships in "A Time To Stand." But I do wish the Akira hadn't been omitted (it does appear on the cover art, but not in the book) since the other FC designs are very well represented, and some pages have glaringly off formatting in the text. Most pages have a glossy sort of finish, but on some (the Defiant's section is an example), it's almost like a print layer is missing and the ink is already a bit worn, while the opposite page looks fine. I'd personally have probably dropped one of the "future" Starfleet vessels or a smaller craft (like the Academy trainer) to include the Akira. Actually it would very much help if there were fifty targets. For one thing any one of them wouldn't be the irresistible one that won you an 8000 ly empire. For another, it would take time and resources to take them each out, giving the enemy time to obliterate your one fleet. 50 days? 50 weeks. Also, planets are not inviolable. See: Deathstar. Or the nova bomb that Changeling Bashir nearly wiped out the entire Bajoran system with. OTOH, whenever these silver-bullet WMDs do work, such as in the 2009 movie, we don't see "ingenuity" as a requirement. You're arguing that since Trek is lazy and unrealistic, it's okay that it's lazy and unrealistic? See: the ingenuity of the Manhattan Project. Also, it doesn't matter how Vulcan was blown so much as that it was. We must take a step beyond that in any case. Trek has cloaks. Why don't cloaked ships kill planets, when it's established that single unopposed ships can do planeticide? Because they want to take the planets. Unless you're saying, again, that nix one planet (Earth) and millions of others are easy pickings. Then it's an easy loss to take. Also, if they know that it's not one planet they'd have to lose but the afore-mentioned 50, that's harder and allows for counteroffensive, including their own now-fair-game homeworld. Also, remember that as soon as the Romulans developed a cloak, Kirk stole one to learn how to defend against. 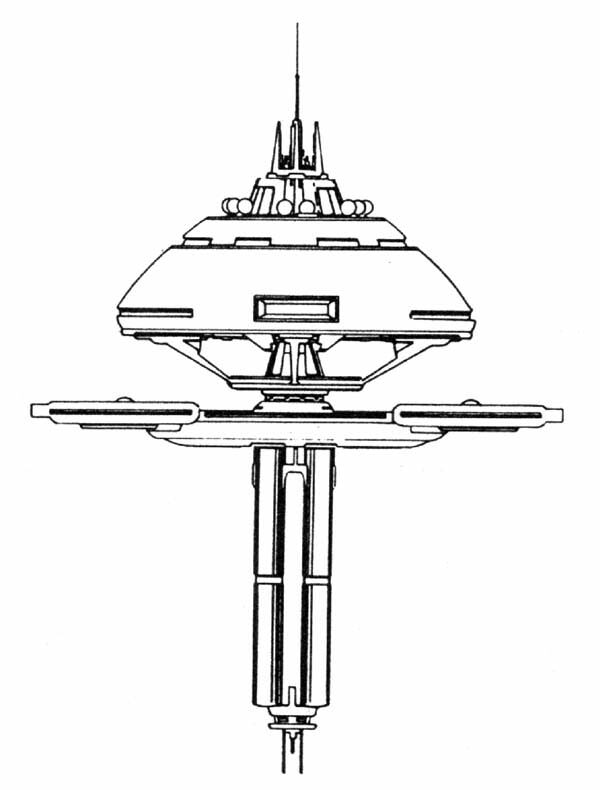 In "Face of the Enemy" Toreth warned Rakal that the Federation is not stupid and could have listening posts and a detection grid in place, so the cloak is not an endgame. That's the key point, after the Dominion War and numerous losses, I'm pretty sure the planetary inhabitants are fed up with StarFleet not being strong enough and local Planetary / Solar Systems not having actual Defense Perimeters. But planets do have local defense perimeters. Those are frequently mentioned in dialogue, even if only when the supervillain of the day shuts them down by making a hypnotic gesture or whatnot. But only shown once the VFX becomes affordable in DS9. It's just that the perimeters are right next to the planets, which is the realistic approach: you can't have that sort of battlesat density across the Romulan border, say. Huh? It's one of the key points of all Star Trek: only the heroes are ever there at X for A, and nobody else is within range to assist them with A. Which again is realistic: the various X where interesting stuff happens are likely to be dozens of lightyears apart even in the best of cases. A border in space has never been defended in Star Trek. The one the most closely resembling the Maginot Line, the Romulan Neutral Zone, leaks like a sieve. So the defenses must be right next to the planets. And concentrating them is good, distributing them is bad. Yes. And if we create a single big one, that's good - we're doing the very best we can. If we divide those resources across multiple capital worlds, that's bad - we're shooting ourselves in the foot, placing less of our resources than we could in the way of the concentrated attack of the nasties. No, it's math. If you distribute, you waste your investment. Sure, you can invest more - but if the enemy is smarter than you and doesn't distribute, he wins with fewer resources. But their distribution is irrelevant in practice. This would be relevant if servers were knocked down by berserkers with AK-47s and RPG-7s shooting them to bits. The cost of air travel to hit more than one or two would already be prohibitive. But that's not how servers go down. A single attack could take a million of them down simultaneously, because they aren't distributed: they are all in the internet. 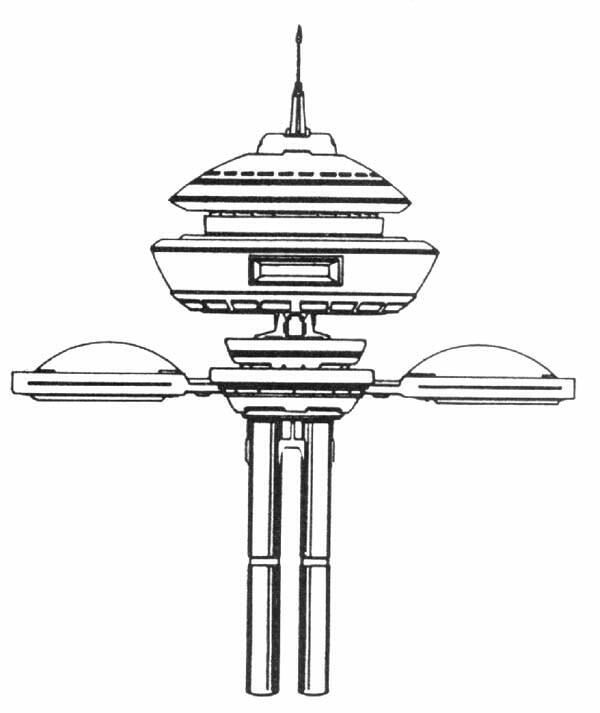 Planetary capitals, OTOH, would be spatially distributed against a spatial threat. And that doesn't help any because those berserkers with their D-7s can trivially travel to all the locations (of which there won't be a million, or else they won't count as capitals) in a short series, overwhelming the distributed defenses. I have no qualms with them having local defenses next to the Planets / Planetoids / Stars / Star System. That being said, actually having them and having a network of sensors to see things coming is common sense. That's why you need ever larger fleets and faster FTL along with cycling people from patrol duty to exploration duty. Yet every time some Romulan or alien tries to cross the Romulan Neutral Zone into Federation territory, their sensor net picks things up and a Federation Ship is sent to deal with them. Exactly like Modern US tactics where we have large sensor networks spread around the US borders and the world. The UFP would do the exact same thing and has done it with countless sensor networks relaying info and having ships dispatched as needed. I guess we're going to agree to disagree. How many ships do you think a local Protective Fleet assigned to a Planetary System would be? What numbers are you thinking? How many Ships in StarFleet by the end of the Dominion War? What is the population of StarFleet by the end of the Dominion War? If the UFP is as vast as it should be along with a equally large population to match that vastness, the Fleet size should be ENORMOUS to Gargantuan. You get diminishing returns by concentrating all your defenses in one area. IRL has a way of dealing with that. The US has the largest Military in the world, several times over. Yet 9/11 didn't stop us, it only angered us into retaliating. And that we did. Any smart large Nation State or Union like the UFP would vastly increase StarFleet's man power, tech, fire power, and capabilities as much as possible. Also with every new territory / populace in a large Nation State / Union, we have better ways of creating redundancy and distributing things. Not really, it works as intended. And Internet can be have numerous protections at each Server with different techniques and defensive FireWalls along with Anti-Malware and other tools. And we can intercept their Berserkers as they come to us. That's why we have a sensor net to see them, intercept them, and deal with them. Having a Defensive & Offensive team running simultaneously is criticial along with numerous fleets. Actually it would very much help if there were fifty targets. For one thing any one of them wouldn't be the irresistible one that won you an 8000 ly empire. They would be irresistible in being weak prey that easily wins you the 8,000 ly empire that is too stupid to defend itself. Attacking a concentrated defense might give the invader pause. Attacking a distributed one would not. For another, it would take time and resources to take them each out, giving the enemy time to obliterate your one fleet. 50 days? 50 weeks. The enemy can't obliterate your fleet, though. It's a basic rule of WWI-style warfare (which is what Trek essentially is): piecemeal fighting guarantees defeat in detail. Say, let's play the defense. You have five times more ships than the invader. You have fifty capital worlds. At each of them, the enemy outguns you ten to one in the first assault; you just lost 1/50 of your fleet, with zero losses to the enemy. The second assault goes just like the first one. By the third, your 48/50 of a fleet may have managed to pull its act together and be there to meet the enemy in force. But where is there? The enemy now obliterates a third capital, the defenders of which just left to join the Grand Fleet, so again the enemy suffers zero losses. Somewhere down the line, your 25/50 of a Grand Fleet may manage to force a pitched battle. But the enemy won't play: the invading fleet will immediately retreat, with minor losses, to recuperate next to its single capital world whose defenses you might now try to overwhelm with your 2.5/1 superiority - but this would mean leaving all your capitals undefended, just like they have been for most of the war already. The enemy could divert 1/10 of its fleet to take down half a dozen capitals while you ponder whether to invade back. Yet OTOH they are. See: all the surviving single capitals. Some sort of a protective mechanism helps out there. Perhaps the obvious one? A backwater like Bajor has no defenses in place, save for that thing at the wormhole. Yet trying to nova-bomb Sol in a runabout would not work because Sol does have the ability to shoot down runabouts at will. You're arguing that since Trek is lazy and unrealistic, it's okay that it's lazy and unrealistic? See: the ingenuity of the Manhattan Project. And scifi is always lazy and unrealistic by definition. Warp drive is fictional specifically in order to sidestep real world hurdles in interstellar travel. It sets up a universe with its own intricate rules of make-believe, and trying e.g. to apply the rules of today's seafaring there is more or less inane. But the make-believe has been fine-tuned so that it still offers some familiarity for the audience, some touch with "realism". Except where it drastically and dramatically and deliberately diverges. Similarly, star empires in Trek are set up in a specific way to cater for specific drama. And the two perhaps counterintuitive features here are that the loss of a capital cripples an empire (why?) and that capitals are seldom lost (why?). This is how the Trek universe has worked for millions of years, so they should know. And it's pretty easy to answer both questions, even though the answers won't be definitive. This is an interesting issue in its own right, as "Face of the Enemy" already shows the impotence of the famed countermeasures. There's more to this than we've been told. A policy of MAD, perhaps? In contrast, we have seen the potency of conventional countermeasures, and the advantages of concentrating: the uncloaked invader needs a thousand time more ships to kill a defended planet than an undefended one. But unavoidable. Distribution won't help: the planet will still be lost. And planets in Trek aren't lost to freak one-off things: there's always a sinister force behind the loss that could repeat the deed at will, until all the alternate planets are lost, too. So what happens? Nero starts out at a non-capital and succeeds, then proceeds to a capital and fails, chiefly because he gave advance warning to the defending heroes. Had he started with a capital, would things have worked out better for him? Or is it only possible to take out non-capitals? That Earth hasn't been taken out has certainly not been for the lack of trying. No doubt attempts at villain homeworlds are also made. But if rare success indeed is met, and a capital is lost, would distribution matter? I mean, where's the downside? Once the single capital is lost, setting up the next isn't hard work. Just pitch some tents and subspace transceivers and whip up the new government on Alpha Omega XXIIIIII½. You needed that backup crew anyway, and if losses are inevitable, then the cheapest and most robust sort of redundancy is desirable - i.e. a hefty supply expendable politicians and civil servants, rather than anything tied to a location, any location. You’re attempting to suggest that a Federation capital world would be 1) weak and 2) stupid. That’s the only way an “all eggs in one basket” precarious setup works. Trek is whatever the writer needs that week. Most weren’t in the military, not were most viewers, so realism isn’t a high priority until a story calls for it. Say, let's play the defense. You have five times more ships than the invader. You have fifty capital worlds. At each of them, the enemy outguns you ten to one in the first assault; you just lost 1/50 of your fleet, with zero losses to the enemy. The second assault goes just like the first one. By the third, your 48/50 of a fleet may have managed to pull its act together and be there to meet the enemy in force. One fleet would take months to reach and take all capital worlds and a fraction of that time to attack one. You wouldn’t be playing defense; you’d be using that time to strike back, since you can, given that your capital is still in tact and able to give orders. A backwater like Bajor has no defenses in place, save for that thing at the wormhole. Yet trying to nova-bomb Sol in a runabout would not work because Sol does have the ability to shoot down runabouts at will. Bajor was a “backwater” far more advanced than we actually may ever be. It was also protected by Starfleet, which didn’t seemed to have a solar defense plan in place. And scifi is always lazy and unrealistic by definition. Yet we don’t have to be. Trek’s being less lazy than say Flash Gordon has made a lot of sci-fi today less lazy and unrealistic. We’re here discussing the areas it still needs to work on. Nero starts out at a non-capital and succeeds, Or is it only possible to take out non-capitals? If they were doing a “Parallels”-like episode and it was Earth, it would have been lost just as easily, “defenses” aside. “Drama” over reality. Eye. Roll. That Earth hasn't been taken out has certainly not been for the lack of trying. The ONLY reason Earth hasn’t been taken out is because of real world, not in-universe, reasons. Reset button is harder to press there, and watch some future incarnation show an “occupied” Earth at the very least. Once the single capital is lost, setting up the next isn't hard work. Just pitch some tents and subspace transceivers and whip up the new government on Alpha Omega XXIIIIII½. There we agree. But it makes more sense that there is a line of succession to well-fortified capital worlds instead of a post-apocalyptic scramble for order and legitimacy. It would be weak by default, if it can only have a fraction of the defenses available. The fewer capitals, the larger the fraction and the more powerful the capitals. And one is the optimum number there. That is, assuming that mobile assets such as starships are relevant at all. Fixed fortifications seemed to work fine on their own in DS9, and might do so in general, leaving the possible starships free-roaming and at liberty to concentrate on counteroffensives. But the Dominion fought starships with starships anyway. So did the Feds and Klingons on many an occasion. Hence the issue of how to distribute those ships gains relevance. As for stupid, the hands of the defender are tied in the general case. It's not possible to know where the attacker will strike next in Trek - especially the Klingons are credited with cloaking their strategic movements, but even the meek Maquis can do that. You have to guess. And guessing means carnage, unless you somehow beat the odds. Why would this be relevant? Militaries don't distribute capitals, either. They realistically concentrate defenses. While Trek may be unrealistic for a show about an interstellar empire, according to those postulating real interstellar empires, it works pretty well as an analogy to familiar Terran empires. Only with caveats where the audiences can readily tell they're not on Terra and should be seeing something spacey instead. One fleet would take months to reach and take all capital worlds and a fraction of that time to attack one. And? In those months, all the capitals would be dust. You wouldn’t be playing defense; you’d be using that time to strike back, since you can, given that your capital is still in tact and able to give orders. Striking back is separate from retaining the chain of command. The availability of your military assets would depend on their distribution so you would have none free for action when defending all your 49 surviving bases. The survival of the command chain would in turn depend on the distribution of the related hardware and personnel. Are you going to invest in fifty times the command infrastructure for redundancy, or to divide what you have in fifty lots? Command infrastructure is relatively light and cheap - all you need is ansibles. And you can distribute that even if you stick to the one defensible capital. Who's talking "us"? We probably will never get to the stars to begin with. In Trek, though, Bajor is devoid of infrastructure as far as we know - no orbital fortresses, native defense fleets derided by their very operators, constant references to enduring shortages due to the recent occupation. Having a bit of a fleet there apparently helps: Cardassia/Dominion never tries to take the place by force after said fleet makes it their forward base. But that's different from saying that distributing your defensive resources keeps your multiple capitals safe. The Alpha Axis didn't really distribute: they concentrated major assets at this non-capital (an entire Fleet out of only a dozen apparently in existence) for extended periods of time. And the offensive power of the Fleet was thus weakened: had it taken major offensive action, it would have been Betazed all over again, with the invader now concentrating its forces and overwhelming nonexistent fixed defenses when the local Fleet was away. Exactly. Because defensive fortifications take time and effort and resources to build. Which is why they should not be distributed willy-nilly. Sure, given time, every capital out there could be as powerfully fortified as Earth supposedly was at time T. But, given the Trek premise of a reasonably even rat race with Klingons and the like, the enemy would be all the more powerful in this given time, too. Distributing would be a gamble. Concentrating would be playing it safe. But gambles might pay off in the long term anyway (that's how you win in Civilization or the like). The ONLY reason Earth hasn’t been taken out is because of real world, not in-universe, reasons. But in-universe, there are in-universe reasons. Obviously. Because that's what being in-universe means. Earth is protected by something, as are other capitals as a general rule. We can argue this something is divine intervention, which is both a good analogy to the true, real-world reason and a valid Trek phenomenon by itself. But we probably shouldn't overplay that card: Bajor quite apparently enjoys a degree of divine protection, but the heroes and villains when confronted by this knowledge don't believe in it much and clearly don't inherently think in those terms, so they must usually be believing in something else, in-universe. Scramble for legitimacy would be inherent in a multipolar setup anyway. Possibly this is how star empires die? Those with distributed spare capitals disintegrate once the one above the others is lost, as the survivors fight for the spoils. Those without disintegrate more mercifully. It would be weak by default, if it can only have a fraction of the defenses available. The fewer capitals, the larger the fraction and the more powerful the capitals. Or they could invest in near equal defenses for each of them and be near invincible. And while the whole enemy fleet engages one capital, the allied fleet can engage the sole enemy stronghold and end the war before the enemy fleet gets to capital 2 of 10. And one is the optimum number there. What the alternative? Leaving your stationary assets open to repeated attack? That is, those strong enough to repel the initial ones? It’s relevant because you’re ascribing sets of tactics to a show that doesn’t follow any. They could use WWI, WWII, Gulf War II, or Napoleonic tactics interchangeably. Not before the single enemy capital was taken. Exactly. Because defensive fortifications take time and effort and resources to build. They’d been there for 6 years, at the most important station in half the galaxy. It’s not that it took time. t’s that it’s a TV show and we’re thinking more about logical defense precautions than they did. But in-universe, there are in-universe reasons. Obviously. Because that's what being in-universe means. You’re ascribing causation to correlation. They just got lucky. Scramble for legitimacy would be inherent in a multipolar setup anyway. Why? If the President dies, the Secretary of Transportation can’t seize power from the Vice President or the others above them. Maybe that’s the case for some banana republic, or the Klingon Empire, but with a clear line of succession in a free and civilized society, it’s less likely. Possibly this is how star empires die? Those with distributed spare capitals disintegrate once the one above the others is lost, as the survivors fight for the spoils. Those without ***disintegrate more mercifully***. I have always found it weird at the size of the Tplana Hath (Spelled wrong I know) the ship is supposed to be a warp capable science ship and yet it has no visible warp engines, runabout size and hardly any crew room. It also bears little resemblance to other Vulcan ships we see later in Enterprise. My headcannon for this is that the ship that touched down in Bozeman Montana was actually a shuttlecraft from the actual Vulcan survey ship which was in orbit of Earth. That may be it. Or it could be the landing portion of the larger ship it uncoupled from. Or it could be a tiny ship and the stoic “submariner” Vulcans inside didn’t mind the cramptness. I thought the three orange glowing bits were the warp engines, before ENT suggested Vulcans use ringship Enterprise engines. Also, ENT put those glowing bits, or structures very much like them, onto the Flash Gordonesque craft that fought the heroes' shuttlepod at Vulcan. This craft was previously seen recovering the stranded Vulcans in "Carbon Creek", and the rescue was said to have been effected by one "survey vessel D'Vahl" - another case of a "ship" we see actually being a sublight shuttle for said ship? The reuse of this four-podded, canard-winged craft in the Vulcan trilogy later on makes her look quite small, possibly even smaller than the old tub that crashed the trio in Pennsylvania in the first place. An unlikely interstellar ship, then, warp or no warp. In my jumbled headcanon, plenty of fanon is also rattling about. And of course different people have had different ideas on the name of the Vulcan vessel that made first contact with Earth. What better way to reconcile between conflicting names than to decide that one applies to the mothership while another applies to the lander that was at the thick of things? I was looking over my copy of the Haynes BOP book last night and had some interesting thoughts. Ex Astris Scientia has an interesting article about the scale issues with the model in later series, and while it's undeniable that some BOPs are kind of wacky on the size scale (particularly in DS9), it would seem that for TNG they generally tried more or less to keep the model a relatively consistent size. Generally, it's become a common practice to assume there are at least two major variants: the big K'vorts and the smaller B'Rels. The Haynes book keeps this terminology since it uses the Rotarran as the B'rel class exemplar. But in reading over the EAS article, I got to wondering whether this is the best solution. In terms of canon dialogue, the K'vort name was only ever used twice - once in the alternate timeline of "Yesterday's Enterprise" for a scaled up model that was also described as a battle cruiser in dialogue. The second use was in DS9's "Penumbra" to describe a missing vessel, establishing the term in the "normal" timeline also. The B'rel name was only spoken once in "Rascals," and that episode reused the YE battle stock footage so there's not much of a size difference there. I'm wondering if it would make more sense to assume the actual designs might be variants, but intended to be scaled much closer than normal. This solution obviously doesn't address the visual scale problems, but it arguably makes at least as much sense as assuming the Klingons just made a bunch of variants that look identical even if their size and capabilities differ widely. 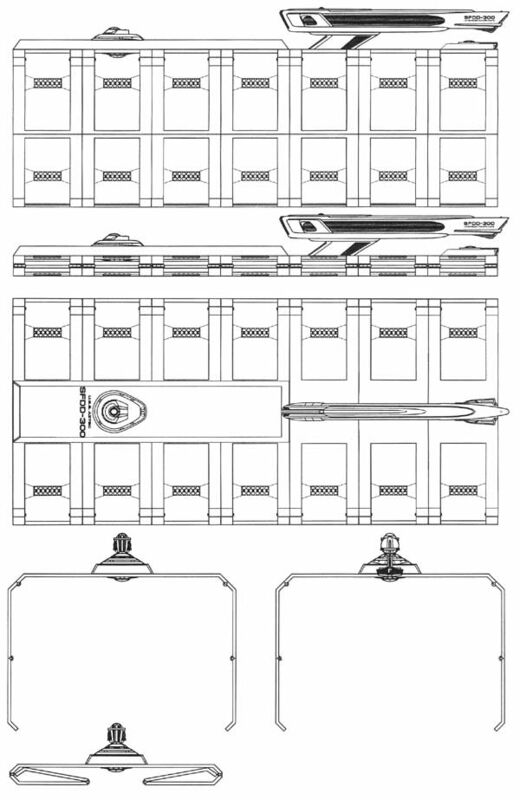 Interestingly, FASA also included the size differences and have effectively two classes in their RPG, with a third frigate scale being added in a supplement, but most of this work predates TNG. The basis of this was that the two powers had a formal military exchange and alliance in the late 23rd century, with the Federation as a common enemy, and the Klingons got some S-11 hulls and plasma weapons in return for D-7 hulls and a few minor designs along with photon torpedo technology. 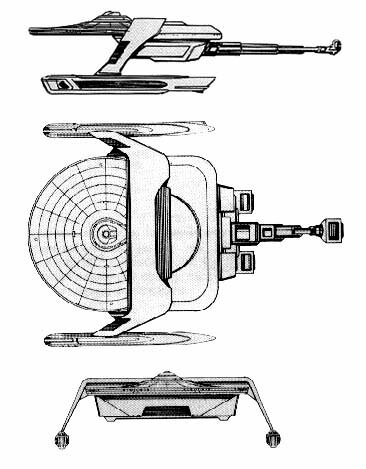 The Romulans stipulated that they were not supposed to modify the S-11 hulls beyond basic fleet use, but the Klingons did so anyway in making scaled up versions. Interestingly, the K-22 is mentioned as having a single aft disruptor which is not present on the S-11. The only time I can recall seeing a rear BOP weapon is against the Defiant in "Way of the Warrior," but I might be wrong. The Haynes manual lists no rear weaponry on the B'rel and doesn't specify if the K'vort might carry such mounts. This was the first "illegal" scaled up version that the Klingons made, with the FASA size being around 110m (similar to the intended official size of the filming model). 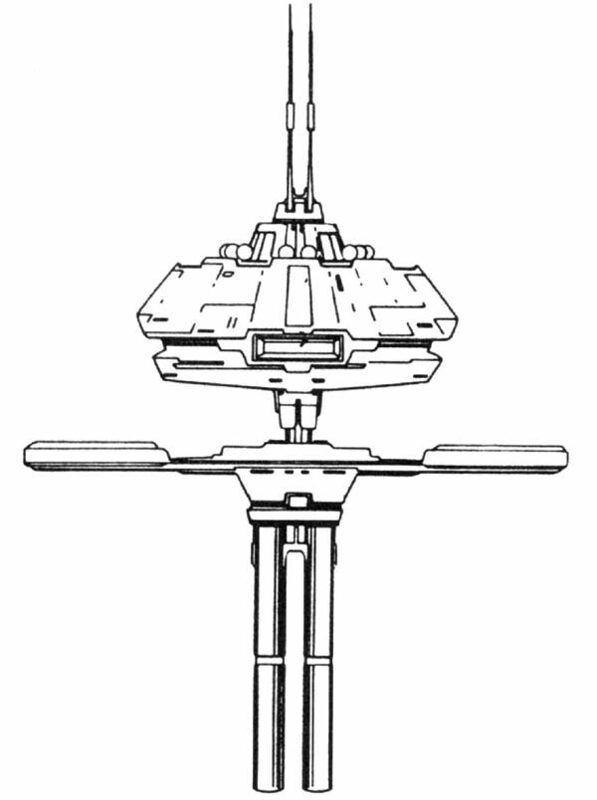 The basic model has both fore and aft torpedoes, and the main variant mounts a Romulan plasma weapon in the forward arc while keeping the aft launcher. The largest FASA variant at 164m, the Great Bird is basically a heavier frigate version with good maneuverability and heavier armament. It notably lacks the ability to land like the smaller variants can. The Romulans decided to retaliate by effectively copying this design and building their own. Somewhat amusingly, their primary mission involves hunting down Klingon variants. publiusr and Charles Markov like this.